CLICK HERE TO BE DIRECTED TO THE NEW SPENDING FAST BOOTCAMP COURSE! A step-by-step course to help you get out of debt and on with your life! 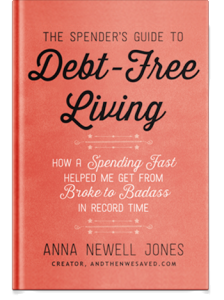 I’m Anna Newell Jones, and at the tail-end of 2009 I was suffocating from the weight of my $23,605.10 in debt. I’d reached a breaking point, where my cycle of debt and remorse needed to end so I decided to take drastic action with the decision to stop all unnecessary spending. I made some very serious lifestyle changes by following a Spending Fast and Spending Diet plan, messed up a lot along the way, and ultimately came out victorious when I managed to eliminate all of my debt (close to $24k) in only 15 months! Then, I wrote a book about my whole experience! Now, I’m on a mission to help others live a debt-free life too! Welcome to Spending Fast Boot Camp! MODULE 1: Introduction "Today is the day I decide to become debt free"
How Can You Do What You Want for Free (Or Really Cheap)?